A trip to the beach can be a lot of fun, as long as you take the necessary precautions. The following is a list of items that we suggest packing into your beach bag. Depending on where you live, you may want to omit or add on to this list as you see fit. 1. Get a lay of the land beforehand. If possible go to the beach first alone, or check it out online. Find out how far the parking is, where the rest stops are, where the bathrooms are, are there life guards, how far is the nearest hospital etc. Having a game plan beforehand will help your day go much smoother. Once you get there, inspect the area thoroughly before laying down your beach blanket. Look for glass, trash, and other hazards. 2. Sunscreen! 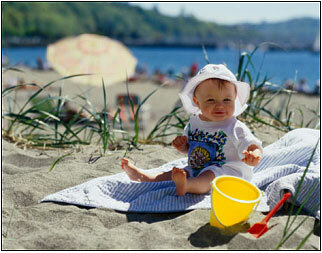 Your baby’s skin is very sensitive to the sun, and they should be protected at all times. Use a baby formula with at least a 50 SPF. Apply liberally every hour or so for optimum protection. Many formulas now come with a tint to them, so you can see where it has been applied. These are great and I recommend picking some up if you can find it. Shade is also important, so consider putting up an umbrella or tent to keep baby out of the sun. Hats are a must too- so find one with a strap to keep baby from pulling it off. 3. Fluids. Just like an adult, your baby will need plenty of fluids to combat that lost in the heat. Pack plenty of juice boxes and water for quick pick me ups. Fruit is also a great treat for keeping your little ones hydrated. 4. Be prepared for stings. Jelly fish stings are the most common type of stings at the beach, and can easily be treated with vinegar. Carry a bottle of vinegar and fresh water. Most stings can be treated with one of the two items. 5. Swimming. Everyone should wear a life jacket and floatation devices. Don’t rely on them however, so always be by babies’ side whenever they are in the water. Remember it only takes an inch or two of water for your baby to drown. 6. Beach blanket. A beach blanket is a must with a toddler. It provides a great place for napping or snacks, and is great for babies that aren’t very fond of sand between their toes.